1. Put lettuce, onion, peas and mint in a large pan. Add chicken broth and bring to boil. Reduce heat and allow to cook for 25 minutes. 2. Using a mixer, thicken into a puré, and strain. 3. Remove crusts from bread and dice finely. Heat Extra Virgin Olive Oil and fry diced bread, stirring with a spoon till a uniform, slightly chestnut color is reached. 4. Remove, allow to drain on paper towel and season, still hot, with a little salt. Besides seasoning, the salt keeps bread crisp. 5. Heat olive oil to medium temperature in a large pan. Incorporate flour and cook for 1 minute, taking care to avoid turning chestnut brown. 6. Remove from heat, add puré and mix well. Heat and cook slowly at simmer or medium temperature, stirring constantly, till brought to boil. Incorporate cream and season with salt and pepper. 7. 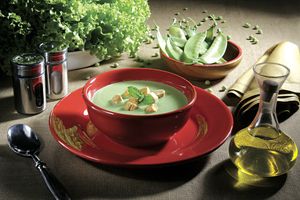 Distribute among bowls, garnish with diced fried bread, and serve.